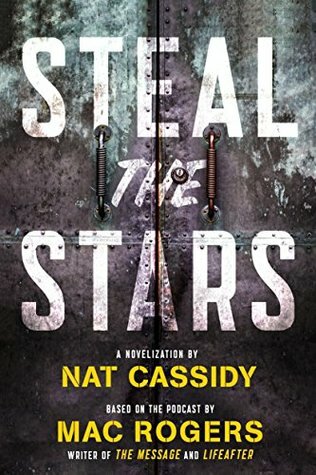 Steal the Stars, a debut novel by Nat Cassidy, is based on the debut science fiction podcast from Tor Labs. About the Author: Born in North Carolina, raised in Arizona, and currently residing in New York City, Nat Cassidy in an award-winning playwright, novelist, actor, and musician. As an actor, he has appeared on television shows such as "Law & Order: SVU" (NBC), "Bull" (CBS), "Blue Bloods" (CBS), "The Following" (Fox), "The Affair" (Showtime), "Red Oaks" (Amazon) "High Maintenance" (HBO), "The Last O.G." (TBS), as well as on stages Off-Broadway, Off-Off-Broadway, and across the country. You can watch him battle giant mutant cockroaches and twentysomething malaise in the horror-comedy film "They Will Outlive Us All," available for streaming on this very site. As a playwright, Nat is known as "one of New York City's rising playwrights, with numerous productions and awards, critical acclaim, and a reputation for producing intelligent, bold, darkly comic plays with one foot in horror and the other in literary allusion" (Usher Nonsense). He writes thrilling, emotionally compelling horror stories about demons, zombies, Old Gods, ghosts, serial killers, werewolves, cannibals, mutants, and all kinds of ends of the world, and his work has been produced and/or developed at places such as The Kennedy Center, Washington National Opera, Primary Stages, The Flea, and numerous other companies throughout New York City and regionally. His scripts have been published by Samuel French, Broadway Play Publishing, Smith & Kraus, Applause Books, NYTE, and Indie Theatre Now. Nat is an alumnus of Primary Stages' ESPADrills and was commissioned by The Kennedy Center as part of the inaugural American Opera Initiative to write a libretto with composer Scott Perkins, which the Washington Times called "brilliant" and "remarkable." Nat was named one of NYTHEATRE.COM's People of the Year in 2011 and is an inductee in the Indie Theater Hall of Fame. Nat is also a member of the multimedia production company, Gideon Media, most recently responsible for the hit podcast STEAL THE STARS, produced alongside Tor Labs (an imprint of Tor Books). Nat played the character of Lloyd in the podcast and wrote the novelization of Mac Roger's audio scripts, which will be published by Tor Books in November 2017. Nat's currently at work on several more horror novels, screenplays, and radio plays. Noteworthy experiences while reading this book: I thought it was an interesting idea that this was based off of a podcast. That I will now have to listen to! Check out author's other books or related books? O yes I hope that there is a book two to this one. Recommend this book? Yes fans of aliens and science fiction will love this one. Notes and Opinions: I didnt know this was based on a podcast series until I noticed we had done a promo post for this title a little while ago. I thought that was fairly interesting. This was a very different take on the whole alien thing and it was done very well. I thought this one was slightly funny at how many complicated check points you had to go through to get to work. The characters were great Dak, Matt, and Moss were wonderful as a cast and this one was a very quick read. This one does have some insta-love in it but for this story it worked out well. It wasn't the focus of the story at large so that might have had something to do with it as well. This book will keep you on your toes as you travel along with the gang as they try to help Moss get free of the government. I couldn't help but hope for a book two! Go Into This One Knowing: insta-love but it works.